Your gift to the campaign sustains excellence across every aspect of academic life but, above all, it supports people — exceptional, motivated students and the professors and student services professionals who instruct, encourage and inspire them. We urge you to contribute. Your gift to the annual fund helps to sustain academic programs, scholarships, innovative programming and support services for MCC students. More importantly, your gift has the power to transform the lives of our students, helping them to realize and achieve their academic and career goals. Transform a life with a tax-deductible donation by December 31. You can make a difference in the daily lives of MCC students like Than Soe Aye, an MCC student who has overcome overwhelming challenges thanks in part to generous donors like you. What goes on in the life of an MCC student goes beyond the ordinary. Than is the eldest of three children, all of whom spent years living in a refugee camp in Thailand before emigrating to the U.S. 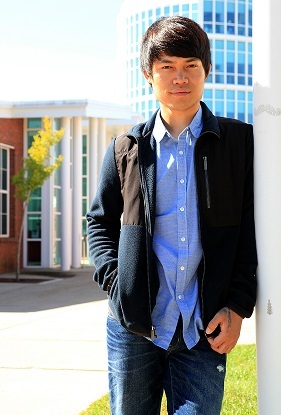 He is currently pursuing an associate in science degree at Manchester Community College. He has already completed the Manufacturing certificate program which enabled him to secure an initial position at Connecticut Tooling and Machining Association. Than now works at Pratt & Whitney, machining engine blades and looking forward to transferring to a baccalaureate institution and eventually earning a master’s degree. Many employers sponsor matching gift programs and will match charitable contributions made by their employees. To find out if your company has a matching gift policy, please contact your organization’s human resources department. Leave your legacy or pay tribute to a friend, family member or perhaps an MCC professor who made a difference in your life. Your brick will be installed in the Alumni Pathway, located in the Richard R. Johnson, Sr. library garden. The garden offers a peaceful, outdoor study and meeting area for students. Your gift will support programs and services for alumni and current students. MCC employees can opt to make a one-time gift or recurring gift through payroll deduction. Last updated October 13, 2017 .